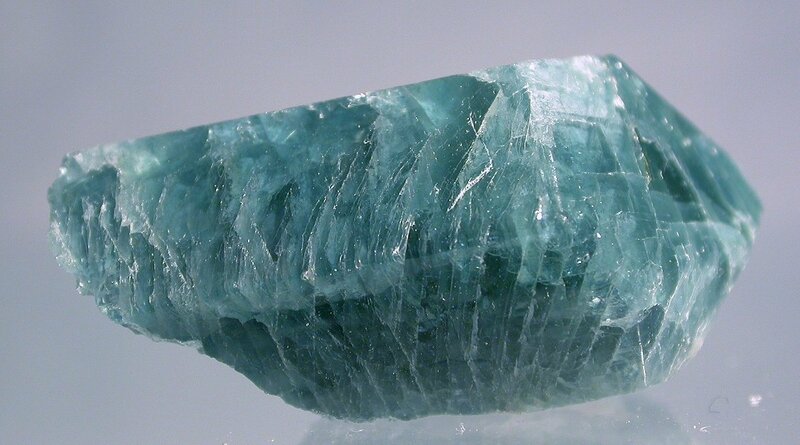 Apatite is a family of phosphate minerals. In forms such as hydroxylapatite or Ca5(PO4)3OH, fluorapatite or Ca5(PO4)3F, and chlorapatite or Ca5(PO4)3Cl, it is often found as an accessory mineral in igneous, sedimentary and metamorphic rocks, usually as fluorapatite. Igneous rocks are formed deep in the earth in volcanoes, while metamorphic rocks are those that change into other types of rocks over eons of time. Some specimens are clear and colorful enough for experts to cut them as gems. Their colors range from colorless, yellow, green and brown. Occasionally, brilliant blue, red or multi-colored minerals are available. Blue stones are sometimes called moroxite. They can either be faceted or made into cabochons, which are domed gems that lack facets. Sometimes, the way the light is scattered in these cabochons gives them the look of a cat’s eye. Apatite is a common mineral on Earth and has even been found on the Moon, where they hold water in a hydroxyl form. The mineral was named in 1786 by Abraham Gottlob Werner, a German geologist. The mineralist Karl Friedrich August Rammelsberg renamed it as fluorapatite in 1860. The name comes from the Greek apatein (“to deceive”) because the mineral resembles so many other minerals. The types of apatite are hard to distinguish from each other, for they can be any color, size, shape or diaphaneity. Apatite is a leading source of phosphorus and can be an ore for rare earth minerals. Miners appreciate this because it is not radioactive. Many of the ores for rare earth minerals are radioactive. The form of apatite known as hydroxylapatite makes up much of the mineral in bone and the enamel on teeth. Synthetic calcium hydroxylapatite is used as a cosmetic dermal filler to plump out thin or dried out areas on the face. Fluorapatite is a source of fluoridated water and fluoridated toothpaste. The group shares a hexagonal crystal system and specimens are found as prismatic, stubby or dipyramidal crystals, which means the specimen looks like two pyramids attached at the base. The mineral is also found in plates and columns, in masses of crystals shaped like grapes or bubbles, in long, needle-like crystals, and in grainy clusters. We find it in masses that are easy to crumble apart, in aggregates made of icicle-like growths (stalactites) and in enormous masses that miners exploit as sources of phosphorus. These huge outcroppings are called collophane. Apatite is fairly hard and stable, but quite brittle. It is the standard mineral for the hardness rating of 5 on the Mohs scale. It is heavy, with poor cleavage, which means it doesn’t split apart neatly. When it’s fractured, the pieces have a shell-like appearance. These minerals often have inclusions, cracks, and tiny tubes. It can be transparent to opaque and has a vitreous or glassy luster. Try scraping it over a streak plate, and you’ll see that it always leaves a white line no matter what the color of the gem is. Some gems fade in color or give off a blue glow when people heat them. Others have a bright yellow glow in ultraviolet light. Hydrochloric acid dissolves apatite, though fluorapatite is a bit more acid-resistant than other types. The mineral has a refractive index of 1.634 to 1.638 and exhibits pleochroism. That means that it can be different colors depending on the angle at which one views it. Blue apatite has a strong blue and yellow color. 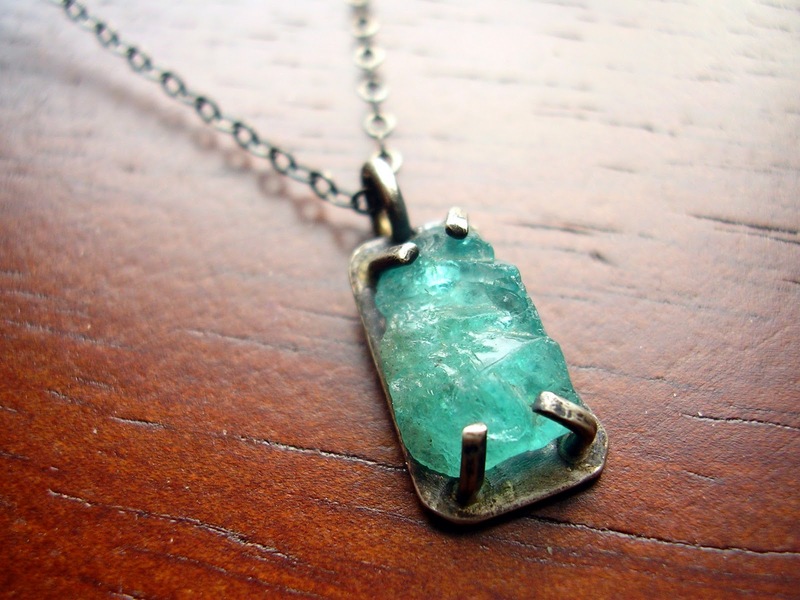 Apatite is a stone that brings inspiration, humanism and the desire to serve. For mystics, it’s a stone that rests at the point where matter and consciousness and the past and the future meet. It helps its wearer develop their psychic gifts and aids in communication and meditation. What’s more, the gem increases a person’s motivation, fortifies their reserves of energy and facilitates openness and social skills by removing negative thoughts about the self and others. It can also calm and draw out children who are autistic or hyperactive. The mineral stimulates the intellect and creativity by clearing away confusion and allowing the person to gather information that benefits them personally or the community as a whole. Apatite eases sorrow, calms anger and expands a person’s access to the truth. As a healing mineral, it supports the health of the bones and stimulates the body to create new, fresh cells. It helps the body absorb calcium, which helps the growth and strength of bones and teeth. Apatite eases arthritis and other joint problems and suppresses hunger for unhealthy foods. It encourages healthy eating, raises the metabolism and helps to lower high blood pressure. It balances the physical, mental, spiritual and emotional selves. Blue apatite helps the wearer connect to a high spiritual plane. It banishes nervousness during public speaking, supports communication within a group and opens the throat chakra. It also quiets the heart and soothes emotional distress. For healing, one should place it on the skin above the problem area. Collectors polish apatite into beautiful gemstones. Though it is brittle, one can wear it as jewelry if one sets it into a protective setting such as a bezel or flush setting. Always handle apatite with care. Customers should not clean the gems with chemicals or ultrasonic cleaners and should keep them away from heat. Where Do We Find Apatite? We can find apatite all over the world, and gem-quality specimens are available in a few locations. You can see beautiful blue-green stones in Finland and Sweden. Deep, lush blue apatites are also visible in Bahia, Minas Gerais, Governador Validates, Sao Jose da Safira and Galileia in Brazil. Other blue apatites are obtainable around Lake Baikal and the Lovozero Massif in Russia. One may also find light blue, opaque specimens in New jersey and Orange County, New York, while lighter blue crystals come from Montana. What do you think about the gem? What are your favorite ways to wear it? Tell us all about it! Hey Buddy!, I found this information for you: "Apatite: The Astonishing Blue Mineral that Went to the Moon". Here is the website link: https://accessgems.com/apatite/. Thank you.